Wine vs. Beer Web journalist Alex Hillsberg sent me an interesting article containing relatively unknown facts of interest to wine and beer enthusiasts: www.financesonline.com/beer-vs-wine/. Did you know that the world’s second best selling wine brand in 2012 was China’s Great Wall, the third most popular wine sold in the U.S. by the glass is Pinot Noir, and that the Czech Republic drinks the most beer in the world (the U.S. is #15 among worldwide countries)? Glowing Reports on California’s 2013 Vintage Monterey County’s Arroyo Seco AVA has wrapped up an ideal harvest that will go down as one of the region’s best. The growing season was dry and mild which limited shatter and yields and provided even ripening. Cool weather in July and August led to extra hang time and good acidity. There were no heat spikes during the growing season. It was a sleepless harvest in the Russian River Valley as growers picked earlier than last year. The harvest was very rapid and compressed with good tonnages that were held in checked by thinning. Cooler temperatures in August slowed the pace of grape ripening, allowing more time for fruit to mature on the vines. September rains were challenging, but overall grape quality, particularly for Pinot Noir and Zinfandel was outstanding. Lane Tanner has New Wine Label Noted veteran Central Coast Pinot Noir vintner, Lane Tanner, has a new wine label - Lumen - and a new partner - Will Henry. The inaugural wine is a Grenache crafted in her inimitable Pinot Noir style. Visit www.lumenwines.com. Sensorist Debuts New Instrument/Gadget for Wine Enthusiasts The system consists of a gateway that is connected to your home network and from there to the internet, a wireless sensor and a wine bottle probe. The probe is equipped with a cork so it can be inserted into a wine bottle filled with water and placed where you store your wine. The probe will record the bottle temperature and humidity, enabling one to see differences when the surrounding environment changes. 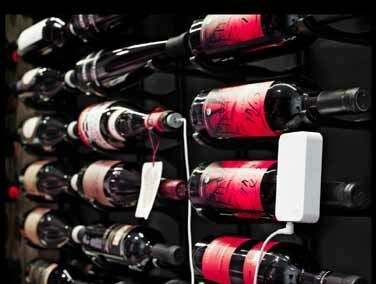 The system is totally wireless and long range so that you can monitor your wine if your are not at home or close to your wine both on the Sensorist website and via an iPhone App. Sensorist monitors daily temperature variations, the humidity of the environment you wine is stored in and alerts you if the cooling system is not operating at the desired temperature. The system supports more than 200 sensors which you can buy anytime. A package for wine enthusiasts consists of a gateway, 2 sensors and a wine bottle probe sells for around $180. Learn more by visiting www.sensorist.com. Triple Creek Ranch Vintner Events Triple Creek Ranch in Darby, Montana, is a recipient of Travel- Leisure magazine World’s Best Award and 2012 World’s Best Service Award. Five 4-day Vintner Events are planned at Triple Creek Ranch for 2014 each featuring a different vintner: Merry Edwards, Ehren Jordan and Anne-Marie Failla, Cyril and Blakesley Chappellet, Howard Mozeico and Jessica Mozeico-Blair of Et Fille, and Lynn and Ron Penner-Ash. For information, visit www.triplecreekranch.com. Marlborough Pinot Noir Rising Read the article by Curtis Marsh who joined a group of Marlborough winegrowers and international wine writers for a trekking adventure with a 4WD coined “The Marlborough Pinot Noir Safari,” The escapade took the group into the hills of the Awatere and Southern Valleys and through the back country routes of Awatere, Brancott, Omaka and Waihopai valleys where they discovered the special sites that are putting Marlborough Pinot Noir on the map. Visit www.thewanderingpalate.com/new-world-pinot-noir/ marlborough-pinot-noir-rising/. 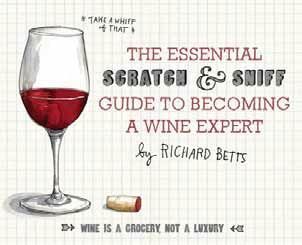 Scratch & Sniff Wine Guide Master Sommelier Richard Betts has written a humorous book that removes wine pretentiousness and substitutes easily understood text, simple language and many explanatory illustrations. There are sixteen scent stickers in the book that allow the reader to interact and smell different elements in wine. A fold out aroma wheel breaks down wines by grape, region and style. An introductory but comprehensive book primarily intended for novices although it can appeal to wine enthusiasts at all levels of expertise. $12. Recent Pinot Noir Tasting Revealed Preference for Less The St. Helena Star and Napa Valley Vintners Tasting Panel reviewed 21 Napa Valley Pinot Noirs from the 2009 to 2012 vintages. As reported in The Drinks Business at www.thedrinksbusiness.com, panelists wanted less extraction, alcohol and oak flavors in Pinot Noir although Napa Valley producers seem to favor deeply colored, extracted and welloaked styles. Three producers who make the preferred “less is more” style were Ceja, Sinskey and Saintsbury, all located in the Carneros region where most of Napa Valley’s 3,000 acres of Pinot Noir are planted. Read the entire article at www.thedrinksbusiness.com/2013/10/napas-less-is-more-pinot-noirs/. Breathometer added to Smartphone-Based Breath Analyzer Offerings Originally featured on the TV show Shark Tank, the Breathometer has now been put into production. Like competitors Floome and Alcohoot, it plugs into a smartphone’s audio jack and connects to an App that can read blood alcohol concentration when one breathes into the key-sized reader. The Breathometer is $50 (money well spent) and is currently available for pre-order. It works with iOS devices that run iOS 7 and Android devices running version 2.3 and above. Visit www.breathometer.com. Short Film on Winemaker Matt Dees of Jonata A movie has been recently produced on Matt Dees commenting about what it is to be a winemaker in California and his love affair with wine grapes. The movie goes live on Monday, October 28, at www.cdsavoia.com/#/artists/matt-dees. French Government Proposes Further Restrictions on Wine The latest online Wine Spectator post (October 22), discusses a bill that the French Senate is considering that would increase the sin taxes on wine and require wine labels to carry the statement, “Alcohol is dangerous to your health.” It is already forbidden in France for journalists to praise a wine too much and the new bill would have extended that restriction to Facebook or Twitter (this part of the bill was later removed). The bill is being supported by the National Association for the Prevention of Alcoholism and Addiction and opposed by French vignerons. - Pinot Noir Retail Price up to $24.99 (20 entries): Best of Class - 2012 Shiloh Road Sonoma County $17.95; Double Gold - 2012 Sebastiani Sonoma Coast $19.00; Gold - 2012 Folie a Deux Sonoma County $20.00, 2009 Karah Estate Vineyard Sonoma Coast $16.00, 2011 MacMurray Ranch Russian River Valley $24.00, 2012 Main & Geary Sonoma Coast $24.95, and 2012 Shiloh Road. - Pinot Noir Retail Prince $25 to $39.99 (52 entries): Best of Class - 2011 Sequana Russian River Valley $38.00; Gold - 2009 Bennett Valley Cellars Bennett Valley $38.00, 2011 Elipsis Wine Company DLM Vineyard “Tina’s Block” $34.99, 2012 Hook & Ladder “Third Alarm” Russian River Valley Estate Reserve $35.00, 2010 Roth Estate Sonoma Coast $28.00, and 2011 Sequana. - Pinot Noir Retail Price $40 and Over (63 entries): Best of Class - 2011 Davis Bynum Winery Jane’s Vineyard Russian River Valley $40.00; Double Gold - 2010 B.R. Cohn Russian River Valley $40.00, 2011 Matrix Buoncristiani Vineyard Reserve Russian River Valley $48, 2011 TR Elliott Russian River Valley $44.00; Gold - 2012 Balletto BCD Vineyard Russian River Valley Estate $42.00, 2012 Balletto Sexton Hill Vineyard Russian River Valley $42.00, 2011 Benziger Family de Coelo Quintus Sonoma Coast $75.00, 2011 Davis Family Vineyards Russian River Valley $45.00, 2011 Davis Family Vineyards Starr Ridge Russian River Valley $50.00, 2011 Davis Family Vineyards Soul Patch Russian River Valley $50.00, 2010 DeLoach Vineyards Green Valley $45.00, 2010 DeLoach Vineyards Van Der Kamp Russian River Valley $48.00, 2010 En Garde Russian River Valley Reserve $58.00, 2011 Matrix Nunes Vineyard Russian River Valley $42.00, 2011 Matrix Nunes Vineyard Reserve $56.00, 2009 Richard Berridge Sonoma Mountain $45.00, 2010 Rodney Strong Vineyards Russian River Valley Reserve $40.00, 2010 Thirty-Seven Sonoma Coast $40.00, 2011 Willowbrook Russian River Valley Estate $42.00, and 2010 Woodenhead Russian River Valley $52.00. CPR Enlivens Pinot Noir I reported in Pinot Briefs in August (www.princeofpinot.com/article/1404/) that the Tasmanian Institute of Agriculture has found that Pinot Noir wines that are microwaved and then fermented without skin contact resulted in wines that had high levels of aromas compounds that are responsible for cherry and chocolate aromas in wine. The process, called “controlled phenolic release,” or CPR, uses microwaves to extract grape skins and juice, decreasing the traditional maceration process. The longer the microwave exposure, the more depth of color and tannin level is achieved. In essence, CPR produces a more efficient release of tannins, phenolics and anthocyanins that maceration and there may be less chance of extracting harsh tannins. CPR also sanitizes the must, removing background yeast and bacteria. A recent post online from the Wine Spectator (October 23, 2013), offered more details on this new technology. Visit www.winespectator.com/webfeature/show/id/49105. As this article points out, there is still considerable work to be done and it is not clear what the impact will be on flavor.